Train delays, like manspreading, are an unavoidable consequence of riding the NYC subway, and there's usually not much you can do to cut through the down time. 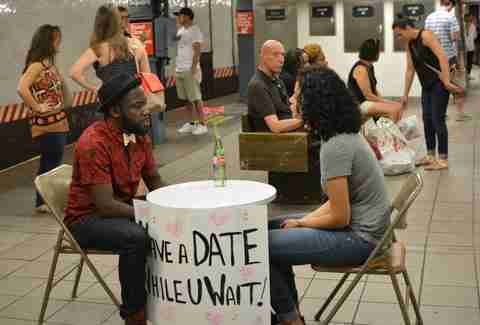 Thanks to an innovative New Yorker named Thomas C Knox, though, there's another option: go on a speed date while you wait. Enlisting the help of his friends Eric, Leigh, and Ibrahim, Knox set up a table and chairs on the Union Square subway platform last Saturday, offering commuters the opportunity to stop and chat while they waited for their train to arrive. 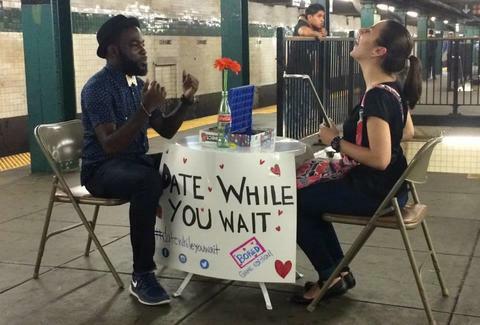 It was a huge success: 18 people sat down and struck up a conversation in the three hours he was there, and just like that, Date While You Wait was born. Inspired by this triumph, Knox set up shop again at the West 4th station on Tuesday evening, this time with an added twist: Connect Four! A worthy opponent! Please share! While the idea of a date on the subway might seem sketchy at first blush, Knox told Thrillist he's not looking for love -- though he's certainly open to it. Instead, he's simply trying to help shift New Yorkers' focus away from negativity, stating that "the main thing is just to make people smile and brighten their day." If you're still not convinced of his intentions, consider this: the dude even started his own nonprofit. It's not just for women, either -- nearly 30% of the people who've stopped at Knox's table have actually been guys, who're either looking for a quick game or hoping to glean some insight into the genius idea. One dude even yelled "I can't believe I didn't come up with this" as he passed by a Connect Four game in progress. When asked about how he picks his stations, Knox told Thrillist it's far from random, taking into account station temperature and platform space to ensure he's not making a nuisance of himself. 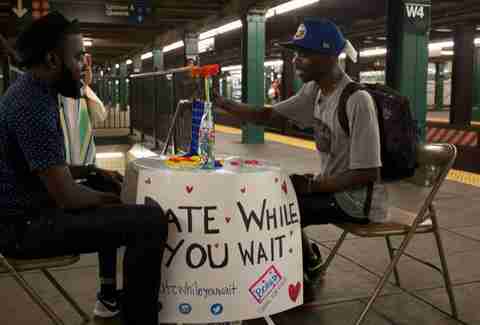 He's got plenty of new twists on the idea to keep things interesting, too, and intends to set up his table once a week at different subway stations. To find out where he'll be next, follow him on Twitter @datewhileuwait.